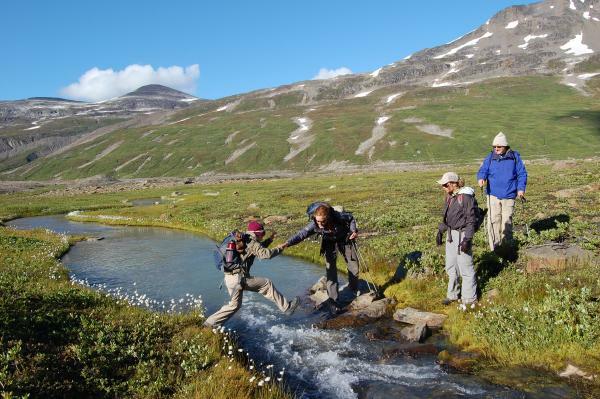 Explore one of the most extensive wilderness areas in North America on this backcountry Alaska camping and hiking tour. Travel to remote McCarthy, a former boomtown in the Gold Rush days. Set foot on Root Glacier or even opt for an ice climb! 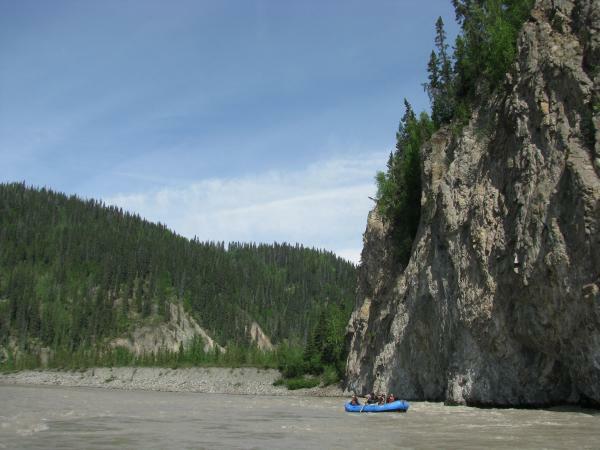 You can also choose to river raft the nearby Kennicott River. The highlight of this Alaska trip is a 3-day, 2-night backcountry camping and hiking experience to Iceberg Lake. From your base camp, explore the surrounding ridgelines and glaciers and enjoy the breathtaking silence of the remote wilderness. 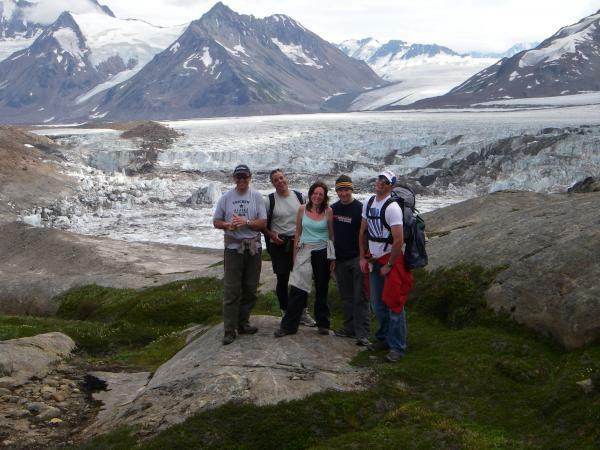 This Alaska adventure can be easily combined with kayaking in Valdez or a rail trip north to hike Denali National Park. Fly into Anchorage where you will overnight in a downtown hotel. Be sure to rest up before your early morning flight tomorrow. Board a charter flight this morning in Anchorage for McCarthy*. Arrive in McCarthy and set out on a private walking tour of Kennicott. 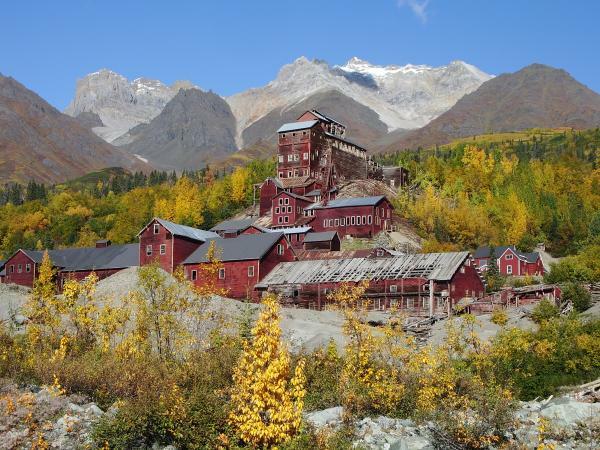 This Alaskan 'ghost town' seems frozen in time from when the Copper Mine abruptly closed in 1938. Inhabitants left behind equipment, buildings and even their personal belongings. 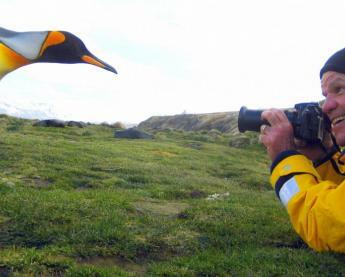 Come and see what it was like to work in this remote wilderness town. Travelers must be prepared for some steep stairs as you explore inside this historic 14 story mill. You will then settle into your guesthouse in Kennicott - the Shushanna Guesthouse located on the south side of town. Your guide can direct guests to the grocery for any food supplies you may need, or opt to eat out your first evening in Kennicott. *Alternative ways to arrive in McCarthy are possible, via commercial flight to Chitina connecting with a charter flight to McCarthy, or other self-drive options. Please contact us for more options. Today you get to pick your way of exploring Root Glacier! 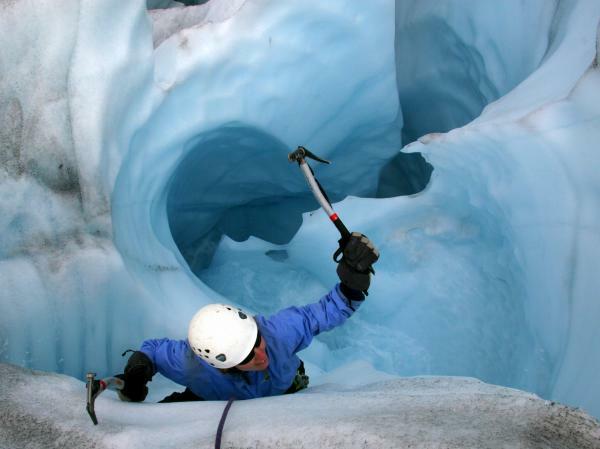 You can opt for a half day glacier walk, a full day glacier walk, or try your hand at ice climbing on Root Glacier. 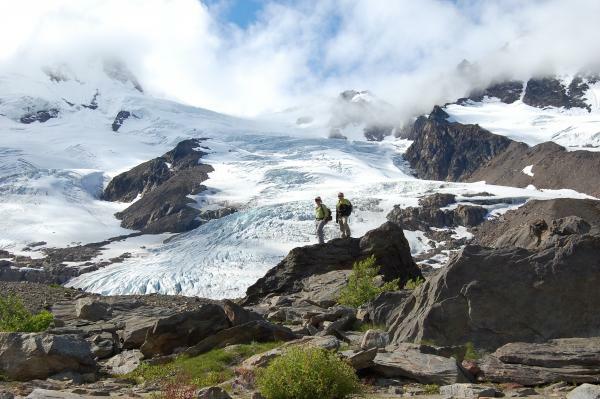 Each of the activities starts out with a moderate 2-mile hike to Root Glacier. The half-day hike allows for time to get out and explore some features of the glacier such as pools and canyons before returning after approximately 5-6 miles total hiking. The full-day adventure allows you to explore the glacier features more thoroughly, such as Donoho Falls which pours under the cracking edge of the glacier. See crevasses, glacial pools, and Jumbo Creek Ice Cave where you are surrounded by blue ice. Suitable for those who are ready to hike 8-10 miles throughout the day for approximately 8 hours.Another option is to try ice climbing along the walls of Root Glacier. This is perfect for the nervous novice or the seasoned climber. You will spend your time with our experienced lead climbers as you practice the sport at your level. Enjoy views of the 7,000 ft Stairway Icefall and the towering Mt. Blackburn peak. For an additional price you can also opt to raft the Kennicott River starting at about a half mile downstream from Root Glacier. Travel through Class II and III rapids on your scenic river journey. 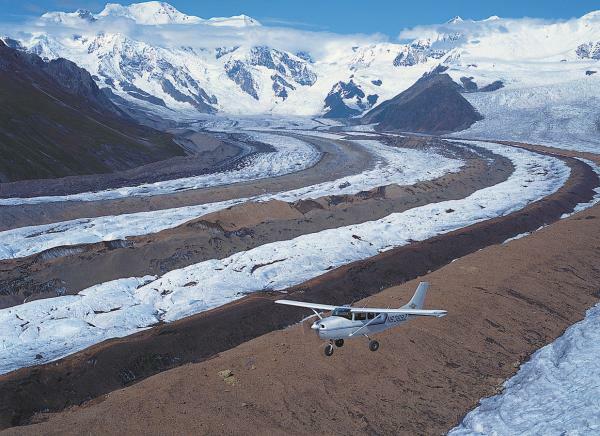 At the takeout, you will board a bush plane for a flightseeing adventure over Root Glacier and the surrounding areas before landing back in McCarthy. Set out this morning for a 3-day basecamp backcountry adventure in the Wrangell-St. Elias National Park. Hop on a bush plane for a 45-minute flightseeing tour south to Iceberg Lake in the Chugach Mountains. This lake is true to its name and filled with icebergs, most of which are now sitting on the dry lakebed. This phenomenon happens often with rivers proceeding from glaciers, then massive glaciers dam up the river helping to create a lake. Yet at some point, the ice dam fails and the created lake drains in a massive event called a jokulhlaup. Settle into your base camp in this beautiful area surrounded by rugged peaks and hanging glaciers. Spend these days hiking the lower tundra areas and see why Iceberg Lake is such an ideal destination for base camping! 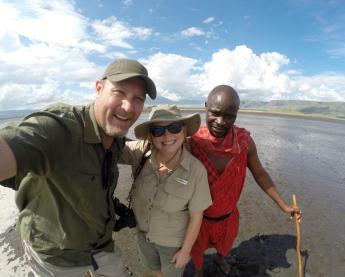 No previous experience is necessary, and your guide is available to hike around the area with you to explore this unspoiled paradise. Enjoy the freedom to relax and explore the surrounding areas without big packs weighing you down! Explore this Alaskan landscape including Bagley Icefield nearby and return to the comfort of your tent at the end of the day. Fly back to McCarthy at the end of Day 6 and settle back into your local guesthouse this evening. 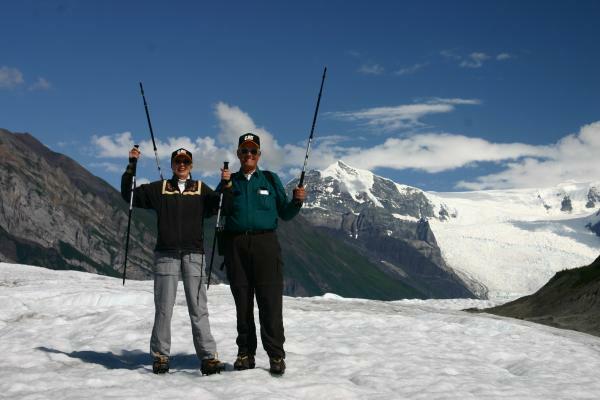 Travelers can opt to enhance your trip to include ice climbing or even change the destination for your basecamping within Wrangell-St. Elias National Park. Set out today for a rafting adventure. Explore the Kennicott & Nizina Rivers on a spectacular rafting trip. The full day tour starts mid-morning from McCarthy. Travel to the put in and set out on the river after a short safety briefing. Stop for lunch along the river and to explore the flat river bar. A bush plane arrives at the junction of the Nizina and Chitina Rivers to take you on a flightsee tour of the area you just rafted! Fly over for aerial views of the Root Glacier and Erie Mine before arriving back at McCarthy in the early evening. Take a charter flight today back to Anchorage where you connect with your flight home or continue your independent Alaska travels. 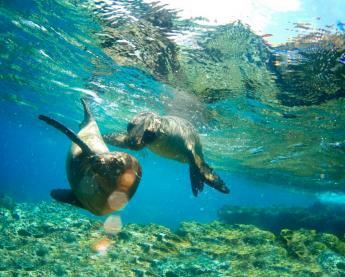 Extend your trip to include a raft and flight float in the area, or head south to Valdez to add a kayaking tour. Rates based on group of 3-5. Contact us for other rates. Both International Arrival and Departure Transfers are budgeting. Final payment is due 100 days prior to departure by bank transfer, credit card, or check. 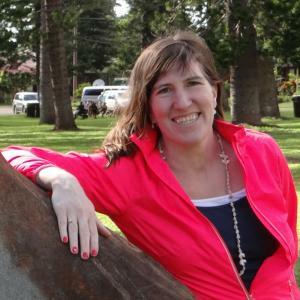 Final payments by credit card may be subject to surcharge and a $20,000 maximum charge.